Trained as a climber and wildlife biologist, John has had a special affinity for wild places ever since he was a child. He is an educator, mountaineer, explorer, entrepreneur and true believer in the power of trust, respect and tolerance. 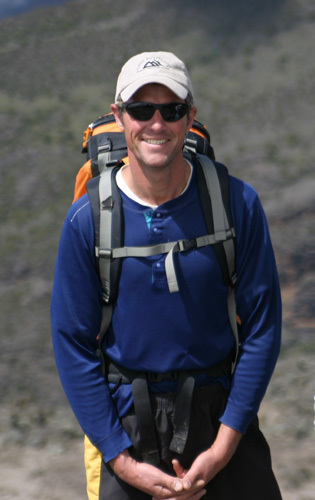 He is our African/Kilimanjaro expert having lived in Kenya where he became fluent in Kiswahili. He has led dozens of Kilimanjaro trips and is active in helping local communities in Arusha. He has had many trips with 100% success and has helped hundreds of climbers to the summit. John is one of the best Kili guides around and an honor to be on the mountain with. John also has a special attraction to Patagonia’s Northern Ice Field where he has conducted numerous expeditions. He has climbed extensively in South America, Europe, Africa, Asia, and North America, including Kilimanjaro, Denali, Aconcagua, Mexico, Yosemite and New Zealand. During his 24-year long career with the National Outdoor Leadership School he accumulated 300+ field weeks and founded and directed the Patagonia Branch in southern Chile for fifteen years. John is a member of Chile’s National Committee on Safety and Risk Prevention in Mountain Sports and a private outdoor risk management consultant. Outstanding experience. Will definitely use AAI in the future. No complaints at all.